Carbohydrate Name Name of the polysaccharide. Microbe Name of the source microbe from which antigenic polysaccharide has been derived. 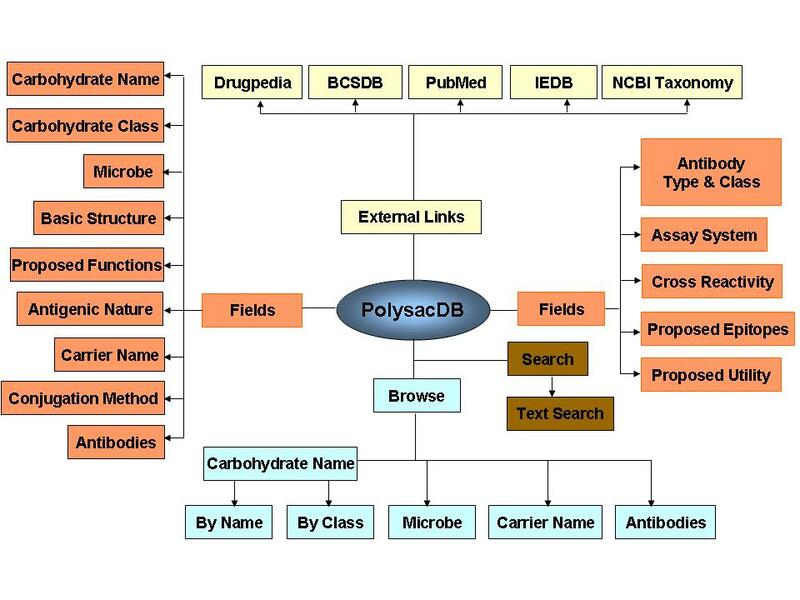 PolysacDB is a manually curated database, wherein most of the data has been collected via literature search from PubMed and PubMed Central databases. Links to other well established databases are also given to make the database more comprehensive such as BCSDB database, IEDB database and NCBI taxonomy database. The database is up-to-date and is regularly updated at regular intervals. This database was constructed mainly to create a resource that would facilitate easy retrieval of information that is otherwise scattered in literature. This is the first time that an attempt has been made to shift the focus away from protein/peptide based antigens and create a comprehensive database of microbe-based polysaccharide antigens. Currently, the database incorporates nearly 1,550 entries for 147 different antigenic polysaccharides from 367 different microbes collected from about 350 peer-reviewed publications. It is expected that the number of entries would increase once the database becomes available to world-wide use. PolysacDB tries to bring the experimental data out into the open in a succinct and consolidated form where immunological and biochemical characteristics of antigen-antibody interactions can be studied in detail. How to search the database ? Entering the Carbohydrate Name .e.g., Arabinogalactan; Capsular polysaccharide; Glucan; Glucurunoxylomannan etc. Microbe Name .e.g., Aspergillus flavus; Bordetella pertusis; Brucella melitensis; Candida albicans etc. Carrier Name e.g., Diphtheria toxoid; Keyhole limpet hemocyanin; Sheep erythrocytes; Tetanus toxoid etc. The webserver allows user to submit their data via Online SubmissionIn order to maintain the quality, we will validate the supplied data before its inclusion. On regular basis, our team will add new data into the database. Ans. It is a database of antigenic polysaccharides of microbial origin and their antibodies. Why to search PolysacDB ? Ans. It gives information on the epitope structures on polysaccharide backbones and provides a basis for designing future vaccines. How to retrieve information from PolysacDB database ? Ans. PolysacDB provides very simple and friendly user interface to search and browse. The "Search Option" webpage facilitates searching the database using user defined keywords. "Browse" option provides a powerful interface to retrieve data without entering keywords. A total of four fields may be browsed directly viz. Antigenic Polysaccharide, Microbe, Carrier Name and Antibodies. We believe that browsing is the easiest way to retrieve data since it directly gives all the information that is available about a particular data unit. What are the different types of bacterial polysaccharides? Ans. Bacterial polysaccharides include peptidoglycan (a major structural component of the periplasm), lipopolysaccharide (linked to the outer membrane), capsular polysaccharide (a predominant part of the capsule that surrounds the whole cell) and extracellular polysaccharides (excretory polysaccharides) (Figure-1). Peptidoglycan that forms a major dry weight content of cell wall in both gram positive and gram negative bacteria, gives mechancial strength and shape to the cell. Lipopolysaccharide (LPS) is a predominant component of the outer-membrane bilayer in gram negative bacteria and conists of lipid A (glycolipid containing fatty acyl chains covalently attached directly to a sugar backbone), an inner core region, and outer O-antigen oligosaccharides (Figure-1). While Lipid A is known for its potent physiological effects in-vivo, LPS binds to CD14 and Toll-like receptor 4 (TLR4) on monocytes and macrophages, thus triggering proinflammatory pathways. Capsular polysaccharides, which form the outermost layer of the cell have a role in virulence, allowing bacteria to evade host defenses including complement-mediated lysis, phagocytosis, and cell-mediated immune mechanisms. What is antibody specificity and avidity? Ans. Antibody specificity depends a lot on the structural configuration of the polysaccharide within its environment, and not all type of antibodies produced may confer protective immune response while antibody avidity that defines the degree of efficiency with which the antibody binds its antigen is relevant not only for assessing the functionality of antibodies, but also for assessing protective immunity induced in humans since only selected epitopes may be responsible for conferring protective antibody response and these may sometimes be masked by other non-protective epitopes. What is the importance of conjugating a polysaccharide to a carrier? Ans. Which type of antibodies would be generated against a polysaccharide depends a lot on the way the polysaccharide was immunized. It was frequently seen that conjugating a polysaccharide to a carrier helped in boosting up the protective immune response by boosting up the T-cell responses.